... or maybe just a growing sense of confidence in the Trumpster-in-Chief. As a conservative, I have theological problems with trade wars, tariffs and the like. As a long-time reader of right-wing thought-rags, I am always afraid that trade wars will end in economic slowdowns and chaos. Still, when Trump started his recent trade wars over steel, aluminum and the rest, I was less certain than I had been. My growing confidence in the orange-haired nutjob came from, among other things, the way he got results from North Korea by taking a hard line. The more I see him work, the more I see that he likes to ask for things way beyond what he really wants and then negotiate back from there. As far as I saw with the aluminum and steel tariffs, South Korea came to the bargaining table and we got some concessions we didn't have before. His policies are leading to good times in lots of places. Dig this. His most recent trade war with China doesn't worry me much at all. I imagine that it's going to end with a negotiated settlement where we get more than we had before. 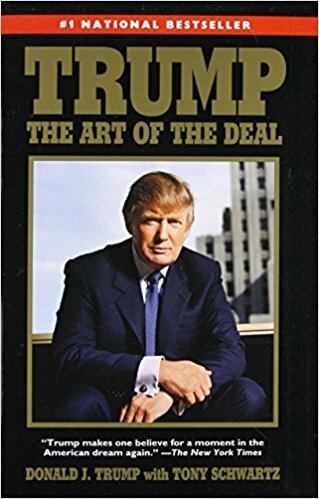 I wonder if he's read this book. It looks like he has. I am hopeful that China will negotiate, they've run rough shod over the world for way too long. I'm not as hopeful about North Korea. In's old man was an artist at rattling cages, getting into negotiations, promising to give up this or that for consessions. Then once he had the consessions, would start right back where he had stopped. Trumps unpredictability, which the Dem opposition posit as weakness, chaos and indiscipline, but which is a powerful 'negotiating' tactic, combined with mostly doing what he said he'd do, sows uncertainty in the minds of enemies of the US, they dare not call his bluff, way too risky. Note for instance the Iranian gunboats harassing US ships in the Gulf of Hormuz are suddenly nowhere to be seen. I wouldn't mind betting they got a little message that the next one to try it would be blown out of the water. And they know a real red line when they see it. He certainly understands business and negotiations.